Microsoft’s Web browser Windows Internet Explorer or IE7 has been released by Microsoft for quite some time. However, this proprietary graphical web browser didn’t seem to bring a lot of excitement in terms of capabilities, browsing speed, stabilities, etc. Comparatively, Firefox has shown better performance and given users more comfort and more fun in browsing. How to make IE7 more competitive so that IE7 users can enjoy better features and more convenience? They can enhance their IE7 with IEPlus. IEPlus or Internet Explorer Plus is an add-on for Microsoft Explorer that will make your IE7 more powerful. Technically, plain IE lacks many features such as ads block, crash recovery, multi-proxy management and browse history management. With IEPlus, you can find all these features added to your IE. For instance, you can customize your personal home page, manage your favourite website and RSS feeds, use various search engines to make search, create personal to-do list to arrange your time, block ads based on URL and contents, activate the crash recovery function, manage multi-proxy, etc. Besides giving you more features, another beauty of this addon is the file size is small. It utilizes very minimal resources but is able to achieve great performance for IE users. The installation of IEPlus is pretty simple. You can download IEPlus via the download link here. After downloading, just install the application. Make sure you close all the IE browsers (if any) when you run your IE browser with IEPlus added for the first time. 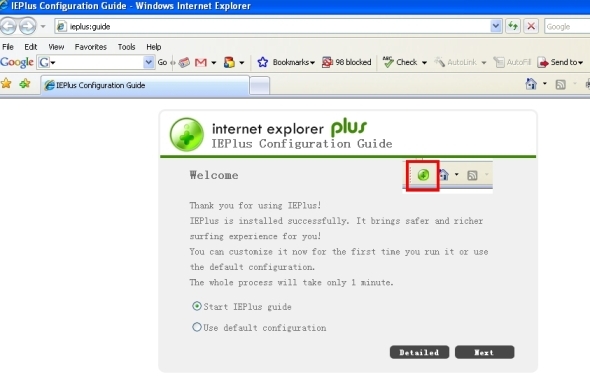 When you first run your IEPlus, your IE browser will show you the “IEPlus Configuration Guide” shown in the photo below. In the IEPlus Configuration Guide, you have options to customize your configuration or use default configuration. If you opt to customize your own configuration, then you just need to follow the configuration wizard and create your own configuration. Once it is done, you can start using IE7 browser with IEPlus addon. With this addon, your browsing experience will be more fun and much more convenient. Read more on IEPlus features.